The Waltax (ワルタックス) is a series of Japanese 4.5×6 folders made from 1940 to 1952, whose body is copied from the Ikonta A. Until 1945, the Waltax was made by Okada Kōgaku and distributed by Nihon Shōkai, and the Okaco or Semi Okaco was a rebadged version distributed by Kawara Shashinki-ten. New models appeared after the war, and some sources say that all these postwar Waltax were made by Daiichi Kōgaku, successor of Okada. However all the Waltax models have Okako logos, one document dated 1948 still shows the name Okada Kōgaku Seiki, and there are hints that the company became Daiichi in 1951. It seems that all the Waltax were made by Okada except the last Waltax Senior, with D.O.C.-Rapid shutter. The Waltax was replaced in early 1952 by the Zenobia, treated in a separate page. 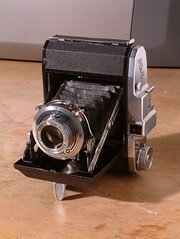 The original Waltax and the Okaco are vertical folders, copied on the 4.5×6 Ikonta, with the typical folding struts. They have a folding optical finder, whose opening is coupled to the release of the folding bed. There is a body release placed to the left of the viewfinder, as seen by the photographer holding the camera horizontally. Some cameras have a depth-of-field scale at the top left or at the top right (see below). The film is wound by a key at the bottom right and the tripod screw is at the bottom left. The back is hinged to the left and the latch consists of a long sliding bar. The body's serial number is engraved in the inner side of the back. An OKAKO TOKYO logo is engraved on the folding struts and embossed in the leather of the back: Okako is the usual abbreviation for Okada Kōgaku. The name is displayed at the front, either Waltax embossed in the front leather, or Okaco etched on a yellowish metal plate riveted to the body, perhaps over the Waltax embossing. The shutter is a five-bladed Dabit-Super giving T, B, 1–500 or B, 1–500 speeds and made by Okada itself. The name "Dabit" might be a clumsy adaptation of "David". The lens is a front-cell focusing Kolex made by Okada too. The Waltax was first advertised in the May 1940 issue of Asahi Camera, and was featured in the new products column of the same magazine the month after. An early leaflet for the Waltax, reproduced below, shows an extremely early camera, with Kolex 7cm F/3.5 lens no.0024 and no depth-of-field indicator on the top plate.. There are two red windows at the top of the back, protected by a horizontally sliding common cover, and the leather covering on the back has a Walz embossing. These features have not been observed so far, and certainly correspond to the earliest examples only. The price is given as ¥180, case included. Various accessories are listed: a hood at ¥2.50, filters (Y1, Y2, Y3, Y3A, R, PO0, PO1, POB) and close-up lenses (no.1 and no.2) at ¥5.00 each. The document mentions the company Nihon Shōkai as the main distributor, and Photo News Sha as the distributor for Kansai (Western Japan). The Waltax and Walz brand names certainly belonged to Nihon Shōkai. Other wartime advertisements for the Waltax were placed by Nihon Shōkai and the wholesale branch of Honjō Shōkai, which certainly replaced Photo News as the Western distributor. 7.5cm f/4.5, four elements (Tessar-type). The official list of set prices dated November 1941 mentions an Okaco II in an elevated price category, probably corresponding to the f/2.8 version. An advertisement dated 1942 or later, again placed by Kawara Shashinki-ten, shows the Semi Okaco II (セミオカコーⅡ型), offered at ¥243 with the f/2.8 lens and described as "available soon". The picture is the same as in August 1941, with no depth-of-field indicator on the top plate. The Waltax was sold in parallel to the Okaco. It appears for ¥160 in the January 1941 official price list, and it appears in the November 1941 price list, certainly with an f/3.5 lens. It is reported that a few advertisements for the Waltax mention the f/2.8 lens. 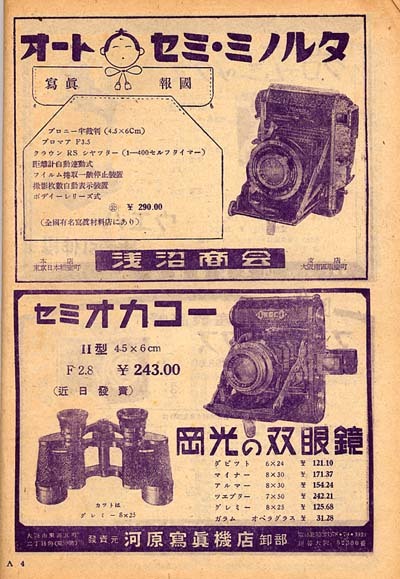 Three advertisements dated 1942 and 1943 give the price of ¥185 and only mention the Kolex Anastigmat 7cm f/3.5 lens; they all seem to show the same picture. The shutter plate has the company name OKAKO TOKYO at the top and nothing at the bottom, the shutter name DABIT–SUPER is inscribed at the bottom of the speed setting rim, and the aperture is set by an index at the bottom of the shutter housing. This arrangement slightly differs from the actual examples observed so far (see below). The April 1943 government inquiry on Japanese camera production has both the Okaco and Waltax. In the document, the two cameras are said to be distributed by Nihon Shōkai; this would defeat the above theory accounting for the existence of two models, or might be a mistake. The Waltax is registered with a Kolex 75/3.5 and the Okaco with a Kolex 75/2.8, both said to have four elements; this contradicts the August 1941 advertisement saying that the f/2.8 lens has five. When mentioned, the range of speeds is given as T, B, 1–500 in all the wartime documents observed so far. Finally, an advertisement dated February 1944 lists the Waltax with f/3.5 lens only, for ¥210, and shows a picture of a camera with no depth-of-field scale. After the war, the original Waltax was briefly advertised again in late 1947. An advertisement dated November 1947 shows a camera with a depth-of-field scale at the top left and a Kolex lens no.160xx or 180xx. The advertisement was placed by the distributor Tōyō Shashinki-zai, and there is no mention of Okada. Okaco, Kolex 7cm f/3.5 lens no.02906, depth-of-field scale on the left, Semi 2600 marking. All the surviving examples observed have a Kolex Anastigmat f/3.5 lens and a single red window at the bottom left of the back, protected by a horizontally sliding cover. The focal length is indicated as 7cm on most cameras, and as 7.5cm on some late examples. Unlike what appears in the wartime Waltax advertising picture, the aperture index is at the top of the shutter housing, and the black shutter plate has OKAKO TOKYO at the top at the top and DABIT–SUPER at the bottom. The evolution of the camera can be reconstructed from the lens number sequence: the Kolex lens was only used on the Okaco and Waltax and the body, lens and shutter numbers seem to match quite closely. The earliest example observed so far is the Okaco pictured in this page, with lens no.02906. It differs from the other cameras by its thicker lens rim, partly hiding the shutter plate, and by the shutter name DABIT–SUPER repeated at the bottom of the speed setting rim. This additional DABIT–SUPER marking is found on another isolated example (lens no.13465), which is also missing the T exposure. Some examples of the Waltax and Okaco have the name SEMI.2600 embossed in the leatherette strip covering the back latch. This is probably related to the release year: 1940 is year 2600 of the Japanese traditional calendar which was commonly used in military Japan. The name "Semi 2600" is only known from the marking on the camera itself and has not yet been observed on any original document. The SEMI.2600 marking was perhaps used until the end of the war and suppressed in 1945; however this is hard to tell because the corresponding leatherette strip is missing from most surviving cameras. Most examples have a rotating depth-of-field scale above the main body. The presence and position of this depth-of-field scale is somewhat erratic. Many early examples have the scale at the top left, except for one isolated camera where it is absent. The part moved to the top right corner around lens no.10000. The scale is often absent after lens no.15000, but isolated examples have the scale on the left or on the right. The T exposure, already absent from the anomalous example mentioned above (lens no.13465), gradually disappeared from the speed range around lens no.17000. After lens no.18000, some examples have the focal length engraved as 7.5cm instead of 7cm; however this change was not adopted once and for all, and both engravings were mixed until the end of the production. These various inconsistencies might correspond to the chaotic resume of production immediately after the war. Original Waltax, Kolex 7cm f/3.5 lens no.17082, no depth-of-field scale. Original Waltax no.20395, Kolex 7.5cm f/3.5 lens no.20097, Dabit-Super shutter no.018863, no depth-of-field scale. All the leatherette covering is missing. The Waltax II has the same main body and folding struts as the original model. It adds a top housing containing the viewfinder, slightly offset to the left. The front window has a thin rectangular trim, separate from the top housing. There is an accessory shoe to the right of the viewfinder, and the body serial number is engraved in front of it. The folding bed release is further to the right, and there is a rotating depth-of-field scale at the right end, normally engraved in feet. The advance knob is at the top left; it has a striated top and a red arrow engraved. The shutter release is placed next to it. There is a small hole in the top housing, very close to the advance knob, containing a film advance indicator, turning red when the film is wound. The film advance is presumably unlocked by the action of the shutter release. The back has a single red window, protected by a sliding cover, used to set the position of the first exposure and as a frame counter. Unlike on the original Waltax, the red window is near the top of the back because the film now runs from right to left. The tripod screw is centered under the camera, and there are thin film flanges at both ends of the bottom plate. The standing leg under the folding bed has a squarish shape and two fillets. The name Waltax is embossed in the front leather. There is a Waltax OKAKO logo engraved in front of the top housing, and OKAKO TOKYO logos engraved in the folding struts and embossed in the leather of the back. The viewfinder front trim is very thin, separate from the top housing. The standing leg has a squarish shape. These two characteristics are shared by the cameras pictured in the 1947 and 1949 advertisements mentioned above. All the later examples observed have a thicker finder trim, part of the top housing, and a standing leg with a more pointed shape. The lens is a Bio-Kolex Anastigmat 7.5cm f/3.5. The shutter has B, 1–500 speeds and is not synchronized. The shutter plate is black, reads OKAKO TOKYO at the top and DABIT–SUPER at the bottom. The early examples of the Waltax II have a presumably uncoated lens and a squarish standing leg under the folding bed. The earliest known camera has body no.20233, earlier than the last original Waltax (no.020395), indicating a short overlap in the production of the two models. The later examples have a coated lens, engraved Bio-Kolex C. Anastigmat with a red C., and have a different standing leg, shaped as on the original Waltax; the transition occurred around body no.25000. The Waltax II (ワルタックスⅡ型) was advertised in Japanese magazines dated December 1947 and January 1948. The December 1947 advertisement in Kohga Gekkan was placed by the distributor Tōyō Shashinki-zai. Compared with the examples observed so far, the pictured camera has a smaller advance knob, and the logo on the top housing is placed in front of the accessory shoe, replacing the body number. This camera is presumably a prototype. The film advance indicator is visible, and the advertisement mentions auto-stop film advance but not double exposure prevention, probably an omission. An advertisement dated April 1948 lists the camera as the "Waltax", with no mention of a model number. The manufacturer's name is given as Okada Kōgaku Seiki. The list of features mentions double exposure prevention and the ability to take 120 and 620 film, but not flash synchronization. The picture shows a camera with the older type of standing leg, and no synch post is visible. The Waltax III (ワルタックスⅢ型) was advertised in Japanese magazines dated mid-1949. The August advertisement in Kohga Gekkan was placed by the same distributor. It mentions the ability to take 620 film, double exposure prevention and flash synchronization. The lens is mentioned as a Bio-Kolex f/3.5, and the shutter is called "Dabit Compur" (ダビツトコンパー), surely by mistake. The picture is the same as in the April 1948 advertisement cited above. The picture of a flash synch connector is patched over the main photograph, giving the fake impression that a portion of the original picture was enlarged. Without knowing the original photograph, the camera looks like it combines the older standing leg and flash synchronization, but it seems that such combination does not exist. The emphasis on flash synchronization certainly indicates that this feature distinguishes the Waltax III from the Waltax II. This is confirmed in an article on Japanese cameras in the December 1949 issue of Photo Art, illustrated by a picture of the original Waltax, which is called the "old model" (旧型) as opposed to the "improved model" (改造型) and "model III" (Ⅲ型). Until 1951, the Waltax II, III appear in relatively few Japanese magazines, and none of the advertisements observed gives a price in Yen. This is perhaps a hint that the cameras were made for export only. The Waltax Senior (ワルタックスシニア) was a renaming of the Waltax III, featured and advertised in Japanese magazines dated 1951 and 1952. 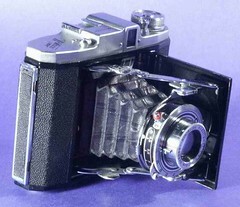 The Waltax Deluxe (ワルタックスデラックス) is the same camera with an added self-timer, which reportedly appears in magazine articles and advertisements at the same date. The December 1951 supplement to Photo Art shows the Waltax Senior and Waltax Acme (see below). The price of the Waltax Senior is given as ¥13,000, case included. The text says that the shutter is a Dabit-Super, but the pictured camera has a D.O.C.-Rapid; it has lens no.345xx and is the earliest known example to have this shutter equipment. The manufacturer is mentioned as "Daiichi Kōgaku, which is well known by its earlier name Okada Kōgaku"; this formulation seems to imply that the name change occurred a short time earlier. This seems to indicate that the change of the shutter name was simultaneous to the change of the company name. 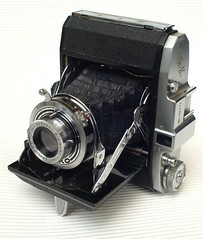 Waltax Senior no.31668, Bio-Kolex C. Anastigmat 7.5cm f/3.5 lens, Dabit-Super shutter. All the synchronized Waltax observed so far show a number of differences from the Waltax II. They are assumed to be examples of the Waltax Senior or late Waltax III. None has a self-timer, and the existence of the Waltax Deluxe is yet unconfirmed. Compared to the late Waltax II, the top housing is slightly different and includes a thicker frame around the viewfinder window. The advance knob is of a newer type, with a shallow depression and a different red arrow. The film advance indicator is smaller and is more distant from the advance knob. Under the camera, the tripod attachment and the film flanges have a smaller diameter and are thicker. The Waltax name is absent from the front leather, but all the other logos are present: Waltax OKAKO in front of the top housing, and OKAKO TOKYO in the struts and in the back leather. Some examples have a MADE IN OCCUPIED JAPAN marking embossed on a small leatherette strip above the back latch. The late examples, with body and lens numbers from about 34500 to about 39000, have a D.O.C.-Rapid shutter. Its features and shape are the same as on the Dabit-Super. The shutter plate is plain silver, and the name D.O.C.–RAPID is engraved at the bottom of the speed setting rim. "D.O.C." surely stands for Daiichi Optical Company, a translation of Daiichi Kōgaku K.K. These late examples of the Waltax were certainly made after Okada changed its name into Daiichi, just before the camera was replaced by the Zenobia. Some of the last cameras do not have the red C. in the lens engraving, probably because lens coating was generalized and no longer a remarkable feature. The Waltax Acme (ワルタックスアクメ) is a rangefinder version of the Waltax Senior. The coupled rangefinder was copied from the 4.5×6 Super Ikonta. The fixed part is contained in a slightly modified top housing; it is separate from the viewfinder and has two round windows. The moving part consists of a rotating wedge prism, mounted on a pivoting arm attached to the shutter housing. The arm contains a train of gears to couple the movement of the prism to the rotation of the lens front element. There is a small casing above the shutter plate to cover the rest of the coupling mechanism; it has a silver face and is inscribed OKAKO TOKYO at the top and presumably DABIT–SUPER at the bottom. The aperture scale has moved to the bottom, and it seems that the ASA synch connector has been replaced by a PC socket. The Waltax Acme was announced in magazine articles and advertisements dated 1951 and 1952. The December 1951 supplement to Photo Art cited above shows a picture and says that the camera would be available soon. The only surviving example known so far is pictured in Sugiyama. It has Bio-Kolex 75/3.5 lens no.00002, and was certainly a prototype. The Waltax Acme was probably never commercially sold. The Waltax Junior (ワルタックスジュニア) is a cheaper model, reportedly featured and advertised in Japanese magazines dated 1950 to 1952. It has no film advance indicator and no depth-of-field scale. The lens is a Bio-Kolex Anastigmat 7.5cm f/4.5, an uncoated triplet lens with front element focusing. The shutter is a two-blade Okako giving B, 25–150 speeds. The shutter plate is silver-coloured with a black stripe, and has an OKAKO marking at the bottom. The Junior does not have the Waltax OKAKO logo at the front of the top housing but has a Waltax Junior engraving at the right end, at the place occupied by the depth-of-field scale on the more expensive models. There is an OKAKO TOKYO logo embossed in the back leatherette, and nothing on the front covering. The body serial number is engraved in front of the accessory shoe. The early version has straight folding struts, different from all the other Waltax models. The first Junior were made before the transition from the Waltax II to the Senior. The earliest known example has lens no.25325. On the very first ones, the shutter is not synchronized, the OKAKO marking on the shutter plate is in big fancy letters, the aperture scale is silver with black numbers, the lens number is inscribed as NO.xxxxx, and the advance knob is of the older type, as found on the Waltax II. A picture of the back of one of these camera reveals a different cover for the red window, sliding under a metal plate attached by four small screws over the leatherette covering. These details were gradually modified: on most examples, the OKAKO marking is written in smaller capital letters, the aperture scale is black with yellowish numbers, the lens number reads N°xxxxx and the red window cover is buried under the leatherette covering, the same as on the other Waltax models, certainly for part standardization. Flash synchronization was added at a later time. Some examples have a single synch pin protruding horizontally at the bottom of the shutter housing, but this was soon replaced by an ASA bayonet post at the top right. At about the same time, the striated advance knob inherited from the Waltax II was replaced by the newer knob of the Waltax Senior. Transitional examples exist, with the older knob and ASA post, or with the newer knob and pin synch. The late version has the same folding struts as the other Waltax models, engraved with the OKAKO TOKYO logo. It was certainly wiser for the company to have the same standard body for the whole range than to have a special cheaper body for the Junior model. The Waltax Junior did not evolve after the introduction of the three-part folding struts. The last observed example has body no.33001 and lens no.32897, released before the switch of the Waltax Senior to the D.O.C.-Rapid shutter. The serial numbers of the body, lens and shutter are very close on all the Okaco and Waltax cameras. The earliest lens number observed is 02906 and the last is 38961; the last body number is 38340. The number sequence continues on the Zenobia models, of which the lowest body serial observed is 39438. If we suppose that the sequence begins at 01000, this makes a total of about 38,000 cameras produced, among which about 19,000 with a folding finder and 19,000 with a top housing. D.O.C.-Rapid shutter no.37959. This example has the highest numbers known so far on a Waltax. ↑ Postwar Waltax attributed to Daiichi Kōgaku: Sugiyama, items 1430–2, Kokusan kamera no rekishi, p.375 (items 1062–8), McKeown, p.239. Lewis, p.61, attributes the Waltax II to Okada. ↑ Advertisement on the third cover of Nihon Shashin Kōgyō Tsūshin, April 20, 1948, reproduced on p.85 of Hyaku-gō goto jūkai no kiroku, showing the company name Okada Kōgaku Seiki. ↑ Supplement to the December 1951 issue of Photo Art, p.11, apparently mentioning a recent change of the company name. ↑ Five blades: leaflet Waltax 4.5 / 6, advertisements dated August 1941 and April 1942 reproduced in Kokusan kamera no rekishi, pp.61 and 107, and advertisement dated March 1943 formerly reproduced in the Gochamaze website]. ↑ Shutter made by Okada: "Kokusan shashinki no genjōchōsa" ("Inquiry into Japanese cameras"), shutter item 18-R-2. ↑ The advertisement on the third cover of Nihon Shashin Kōgyō Tsūshin, April 20, 1948, reproduced on p.85 of Hyaku-gō goto jūkai no kiroku, lists filters and hoods made by Okada under the name ダビッド, written in katakana only, which might correspond to "David" in Roman writing. ↑ Lens made by Okada: "Kokusan shashinki no genjōchōsa" ("Inquiry into Japanese cameras"), lens items La1 and Lb34. ↑ Advertisement reproduced in Kokusan kamera no rekishi, p.61. Earliest known advertisement: same source, p.334. ↑ "Kamera no kōtei kakaku kanpō happyō", November 1941, type 3, section 8C. ↑ "Kokusan shashinki no kōtei kakaku", type 3, section 7B. See also Lewis, p.56. ↑ Advertisement in Hōdō Shashin April 1942, reproduced in Kokusan kamera no rekishi, p.107. — Advertisement dated 1942 reproduced in Nostalgic Camera by Toshio Inamura. — Advertisement in Asahi Graph, 3 March 1943, formerly reproduced at Gochamaze. The background of this advertisement is a map of Southeast Asia, and it is written that the Waltax is rapidly expanding in the Southern Co-Prosperity Sphere (a Japanese expression for the territories to its south that it was occupying): "南方共榮圏ニ躍進スルワルタックス". ↑ "Kokusan shashinki no genjōchōsa" ("Inquiry into Japanese cameras"), items 63 and 66. ↑ Advertisement on the second cover of Nihon Shashin Kōgyō Tsūshin, February 15, 1944, reproduced on p.64 of Hyaku-gō goto jūkai no kiroku. ↑ Kokusan kamera no rekishi, p.375. ↑ Advertisement published in Kohga Gekkan, reproduced in Kokusan kamera no rekishi, p.215. ↑ Lens no.13465: example observed in an online auction. ↑ Examples observed or reported in online auctions: Okaco with lens no.02906 (pictured in this page), Waltax no.06927 with lens no.03723, Okaco with lens no.04593, maybe Waltax no.11534 with lens no.11726. Other mentions of the name "Semi 2600" are found in this page and this page of the AJCC website. ↑ Top left: Okaco, lens no.02906 (pictured in this page) and Waltax, lens no.03723, 06907 and 07762, seen in online auctions. Absent: Waltax, lens no.03126, seen in an online auction. ↑ Waltax with lens no.11620, 11726, 11859, 13465, 13895, 14026, 14054, observed in online auctions, in this post at a Chinese forum, in McKeown, p.745, in Sugiyama, items 1263 and 1429. ↑ Absent: lens no.17082, 19006, 20097 and 20502, pictured in this page, seen in online auctions or sold as lot no.91 of the Apr 23, 2002 Photographic Sale by Bearne's. Top left: lens no.18172, seen in an online auction. Top right: lens no.18439, pictured in Omoide no supuringu-kamera-ten, p.24. ↑ B, 1–500 range: lens no.17082, 18439, 20097, 20502, pictured in this page, seen in online auctions and pictured in Omoide no supuringu-kamera-ten, p.24. T, B, 1–500 range after lens no.17000: lens no.18172, seen in an online auction. ↑ 7.5cm: lens no.18172, 19006 and 20097, pictured in this page, seen in an online auction and reported in the catalogue of the Apr 23, 2002 Photographic Sale by Bearne's. 7cm after lens no.18000: lens no.18439 and 20502, seen in an online auction and pictured in Omoide no supuringu-kamera-ten, p.24. ↑ Example seen in an online auction. ↑ Uncoated lens and early standing leg: body (lens) no.20233 (22292), 21205, 21277 (22697), 23179, seen in online auctions. ↑ Coated lens and newer standing leg: lens no.25184 and body no.27495, seen in online auctions. ↑ Advertisement reproduced in Kokusan kamera no rekishi, p.216. ↑ Photo Art December 1949, pp.36–7. ↑ Lewis, p.61, also says that the Waltax II released in 1947 was for export only. ↑ Supplement to the December 1951 issue of Photo Art, p.11. ↑ Lens marking without the red C.: example pictured in this page of Maachan's blog. ↑ Example pictured in Sugiyama, item 1432. The same picture is reproduced in smaller size in Kokusan kamera no rekishi, p.375. ↑ Two blades: this Flickr page by century_graphic. ↑ Body no.26467, lens no.26226, seen in an online auction. "Kamera no kōtei kakaku kanpō happyō" (カメラの公定価格官報発表, Official announcement of the set prices of the cameras), November 1941. Extract of a table listing Japanese camera production and setting the retail prices, reproduced in "Bebī Semi Fāsuto 'Kore ha bebī wo nanotta semi-ki da'" (ベビーセミファースト"これはベビーを名乗ったセミ機だ", Baby Semi First, 'this is a Semi camera called Baby'), an article by Furukawa Yasuo (古川保男) in Camera Collectors' News no. 277 (July 2000). Nishinomiya: Camera Collectors News-sha. P. 27. Type 3, sections 7B and 8C. "Kokusan shashinki no genjōchōsa" (国産写真機ノ現状調査, Inquiry into Japanese cameras), listing Japanese camera production as of April 1943. Reproduced in Supuringu kamera de ikou: Zen 69 kishu no shōkai to tsukaikata (スプリングカメラでいこう: 全69機種の紹介と使い方, Let's try spring cameras: Presentation and use of 69 machines). Tokyo: Shashinkogyo Syuppan-sha, 2004. ISBN 4-87956-072-3. Pp.180–7. Items 63 and 66. 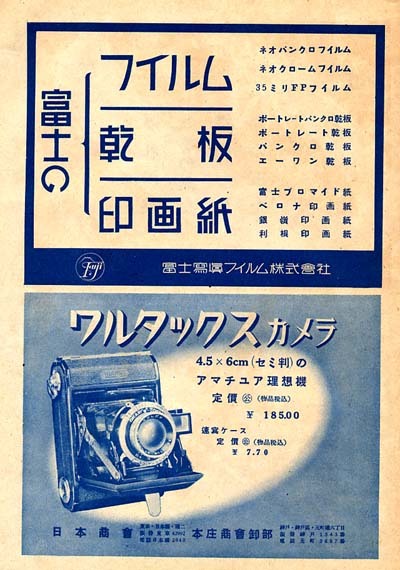 "Kokusan shashinki no kōtei kakaku" (国産写真機の公定価格, Set prices of the Japanese cameras), listing Japanese camera production as of October 25, 1940 and setting the retail prices from December 10, 1940. Published in Asahi Camera January 1941 and reproduced in Shōwa 10—40nen kōkoku ni miru kokusan kamera no rekishi (昭和10〜40年広告にみる国産カメラの歴史, Japanese camera history as seen in advertisements, 1935—1965). Tokyo: Asahi Shinbunsha, 1994. ISBN 4-02-330312-7. Pp.108—9. Type 3, section 7B. Nihon Shashin Kōgyō Tsūshin (日本写真興業通信). Hyaku-gō goto jūkai no kiroku (百号ごと十回の記録, Ten records, every hundred issues). Tokyo: Nihon Shashin Kōgyō Tsūshin Sha (日本写真興業通信社), 1967. No ISBN number. Advertisements on p.64, corresponding to the second cover of the February 15, 1944 issue, and on p.85, corresponding to the third cover of the April 20, 1948 issue. Nihon Shōkai and Photo News Sha. Waltax 4.5 / 6. Leaflet published c.1940 (date not indicated). Document reproduced in this Flickr album by Rebollo_fr. Photo Art 12-gatsu-gō furoku Saishin Kokusan Shashinki Sō-katarogu (フォトアート12月號附録最新国産写真機総カタログ, General catalogue of the latest Japanese cameras, supplement to the December issue). December 1951. P.11. Asahi Camera (アサヒカメラ) editorial staff. Shōwa 10–40nen kōkoku ni miru kokusan kamera no rekishi (昭和10–40年広告にみる国産カメラの歴史, Japanese camera history as seen in advertisements, 1935–1965). Tokyo: Asahi Shinbunsha, 1994. ISBN 4-02-330312-7. Items 35, 345 and 1062–8. Lewis, Gordon, ed. The History of the Japanese Camera. Rochester, N.Y.: George Eastman House, International Museum of Photography & Film, 1991. ISBN 0-935398-17-1 (paper), 0-935398-16-3 (hard). Pp.56, 61, 75 (brief mentions only). McKeown, James M. and Joan C. McKeown's Price Guide to Antique and Classic Cameras, 12th Edition, 2005-2006. USA, Centennial Photo Service, 2004. ISBN 0-931838-40-1 (hardcover). ISBN 0-931838-41-X (softcover). Pp.239 and 745. Omoide no supuringu-kamera-ten (思い出のスプリングカメラ展, Exhibition of beloved self-erecting cameras). Tokyo: JCII Camera Museum, 1992. (Exhibition catalogue, no ISBN number.) P.24. Sugiyama, Kōichi (杉山浩一); Naoi, Hiroaki (直井浩明); Bullock, John R. The Collector's Guide to Japanese Cameras. 国産カメラ図鑑 (Kokusan kamera zukan). Tokyo: Asahi Sonorama, 1985. ISBN 4-257-03187-5. Items 1263 and 1429–32. This page was last edited on 14 June 2017, at 05:29.